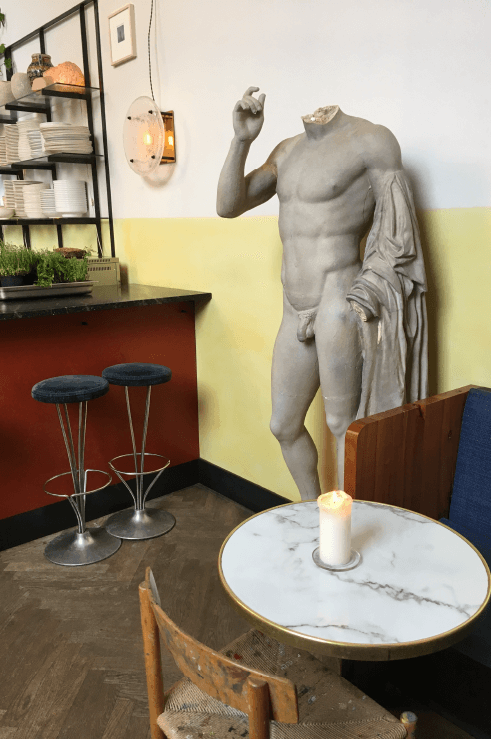 The room, as I recently wrote for Bon Appetit’s Copenhagen City Guide, looks like a 1960’s Eastern European art students’ league, with flea-marketed midcentury pieces, dinged-up/paint-splattered classroom chairs and life-size plasters of classical nudes borrowed from the museum. It feels a little off, which — in case you can’t tell by my site design — makes it perfect. 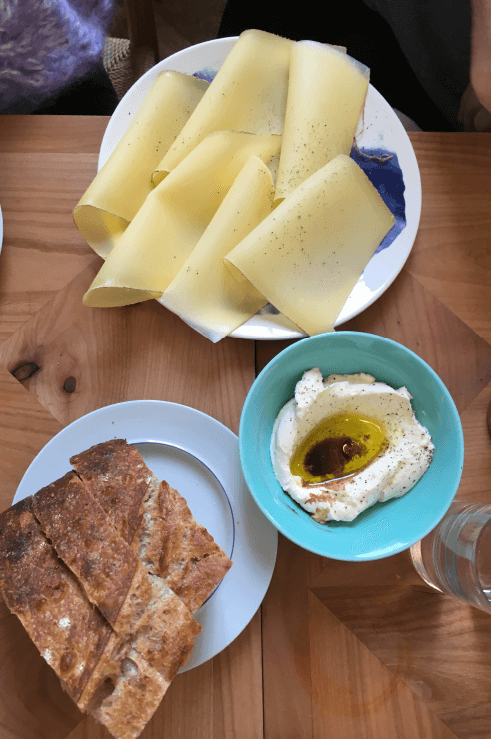 Like many wine bars in Copenhagen right now, the menu is short, seasonal, small plate-y, most likely taking a cue from the excellent Manfreds. (There is also a separate Kantine for students and others, serving a dish of the day from noon til 2 Tuesday through Friday.) During your visit, you’re pretty certain to find a tartare, a ceviche, bright seasonal veg, fresh cheeses or thin curls of Comté served with slices of glorious housemade sourdough on collectible plates by London designer Faye Toogood. You might realize that you’ve over-ordered, or you might tack on a humble roasted root vegetable an hour in. You can order a fresh juice or a bowl of matcha — they’ll look at you like you’re slightly daft if you ask them what alt-milks they have; they don’t even make it with milk-milk — or get into their list of natural wines, as friends and I did on our late-afternoon meal. 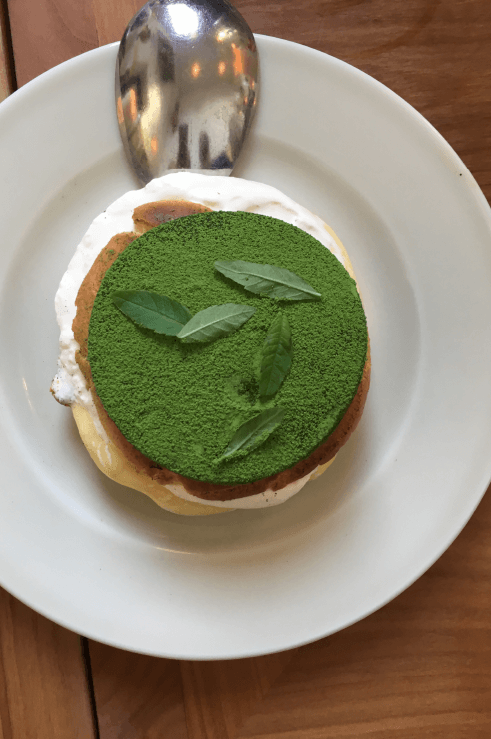 On my visit, everyone had to hold off on attacking dessert until I’d taken enough photos: A matcha-dusted cream puff that married Japan and France, as my favorite pastries do. As I type this, I’m looking at the panna cotta with bee pollen on the current menu and wondering how to beam myself back. What made my afternoon so memorable wasn’t just that I got enjoy that college experience that I only seem to have when traveling, when a coffee with a local friend can stretch into a three-hour session in which we finally figure out the world. In this case, it also led to a second bottle and a speedy bike procession to a design auction, showing me a side of the city that I would have never witnessed. That Apollo Bar enabled us to have both the deep and the silly parts without feeling rushed or strapped into some chef’s vision was exactly what I miss when eating in New York. Summer here means tables in the courtyard, beneath the patinaed copper Poul Henningsen artichoke sconces adorning the 17th-century Baroque palace, as well as a monthly flea market, curated by the owners. I would happily cobble together a miles ticket to be able to see where another afternoon at Apollo Bar led me. Toogood worked for World of Interiors for years before opening her own design company, which makes cool clothes, ceramics, furniture, etc. Given that Apollo Bar feels like an old café you might come across in WoI, it ties it all together nicely. In case the just-right, antique-y feel at Atelier September didn’t tip you off, the co-owners are designers. They also own a design gallery, a boutique, and an exhibition space. In short, you want to go to this flea market. This time, I’ll be sure to spend more time in the museum’s excellent book kiosk after catching an exhibit.